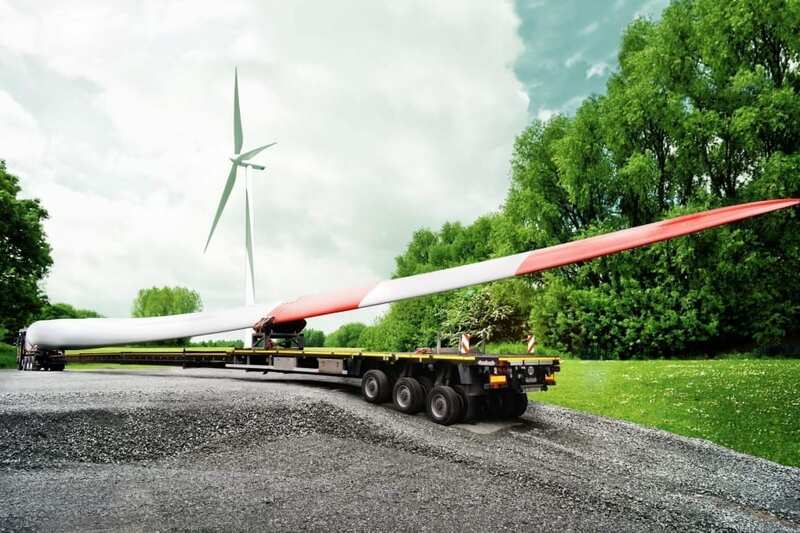 The Nooteboom SUPER WING CARRIER is specially designed to transport extremely long windmill rotor blades by road in a handy and efficient way. In order to generate more power the windmills are getting bigger and bigger. And the rotor blades are getting bigger and longer too, measuring up to 70m in length. Conventional extendible semi-trailers are no longer a practical option. The SUPER WING CARRIER is internationally extremely popular for the transport of rotor blades that are 50m long or longer. The SUPER WING CARRIER is anything but a conventional, extendible semi-trailer. When the rotor blades are getting longer they are also wider and even have a slightly different shape. This means that the centre of gravity will no longer be right above the central main beam of the semi-trailer. Therefore the load floor of the SUPER WING CARRIER is not only longer, it is stronger too. The excellent torsional stiffness of the construction, made of high-grade steel, ensures the trailer won’t tip over during the transport due to the centre of gravity of the load or a cross wind. Moreover, the extremely strong chassis beams ensure there is no extra bending force or torsional stress on the load. The chassis can support rotor blades of any type or make in different positions. The SUPER WING CARRIER is equipped with pendle axles providing a steering angle of 60 degrees. The pendle axles also ensure the vehicle remains extremely stable especially at maximum steering angles. This is due to the fact that the suspension track width of the pendle axles never changes, in contrast with the turntable steering of conventional extendible semi-trailers. Furthermore, with the generous 60cm suspension travel extra ground clearance can be created to negotiate obstacles. In most European countries 12t per axle line is permitted because of the pendle axles. The SUPER WING CARRIER is equipped with a special, hydraulic gooseneck, adjustable in height with 82cm stroke to create extra ground clearance at the front of the vehicle. With this clever design it is possible to adjust the height of the gooseneck during transport even though it is fully supporting the load. The fifth wheel will automatically stay in horizontal position, so that it is possible to drive normally with the gooseneck positioned at any chosen height. The load floor can be coupled to the gooseneck at two different heights. The higher position is used if the rotor blade is loaded on the gooseneck and provides the greatest ground clearance. The lower position is used if the rotor blade is supported behind the gooseneck and this provides the lowest transport height. The load floor of the SUPER WING CARRIER is quadruple extendible, from around 18m up to around 64m, which makes it possible to transport rotor blades measuring up to approx. 70m. The short, retracted length offers important advantages regarding exemption in a number of European countries. On top of the load floor of the SUPER WING CARRIER an extra moveable support beam can be mounted. This makes it possible to retract the vehicle during transport by approx.12m without moving the load. By temporarily creating a shorter wheel base even the tightest bends can be negotiated. Together with the adjustable gooseneck, the suspension stroke and steering angle of the pendle axles this makes the SUPER WING CARRIER more manoeuvrable than ever, which is necessary for these lengths. Loaded vehicle temporarily retractable during transport.